I RECEIVED YOUR LETTER THAT YOU’VE WRITTEN ON THANKSGIVING DAY. TONIGHT I’M ANSWERING ON CHRISTMAS EVE. HOW ARE YOU? HOPING ALL’S WELL. I’M FINE. MOST OF THE BOYS ARE DOWN IN THE NEARBY TOWN – CELEBRATING DANCE – DRINKS. I’M SPENDING MINE QUIETLY – SITTING BY A FIRESIDE. WRITING LETTERS – LISTENING TO JACK BENNY ON THE AIR – AND THE SAME TIME ANSWERING PHONE IN THE CP. JUST HAD A CALL FROM S/SGT GEORGE HAGIWARA – FEELING HIGH – UP IN THE MOUNTAINS WITH CO. “C”. 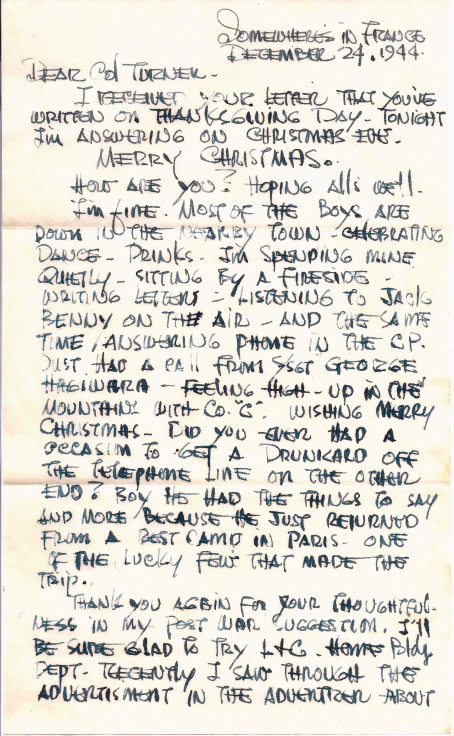 WISHING MERRY CHRISTMAS – DID YOU EVER HAD A OCCASION TO GET A DRUNKARD OFF THE TELEPHONE LINE ON THE OTHER END? BOY HE HAD THE THINGS TO SAY AND MORE BECAUSE HE JUST RETURNED FROM A REST CAMP IN PARIS – ONE OF THE LUCKY FEW THAT MADE THE TRIP. THANK YOU AGAIN FOR YOUR THOUGHTFULNESS IN MY POST WAR SUGGESTION. I’LL BE SURE GLAD TO TRY L&C HOME BLDG DEPT. RECENTLY I SAW THROUGH THE ADVERTISMENT IN THE ADVERTISER ABOUT A SMALL HOME BUILT SOMEWHERE IN MCCULLY USING CANEC BOARD – SOUNDS VERY INTERESTING. GUESS KAJI AND KUNI ARE ALREADY HOME – BET THEY HAVE THE GRIPES TO TELL YOU. 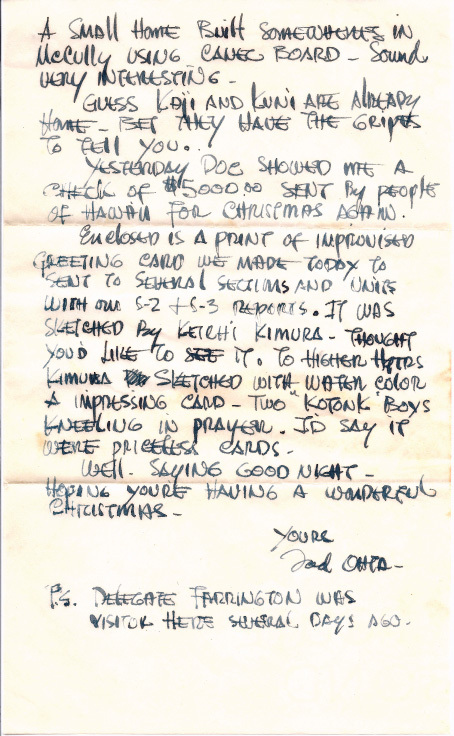 YESTERDAY DOC SHOWED ME A CHECK OF $5000.00 SENT BY PEOPLE OF HAWAII FOR CHRISTMAS AGAIN. ENCLOSED IS A PRINT OF IMPROVISED GREETING CARD WE MADE TODAY TO SENT TO SEVERAL SECTIONS AND UNITS WITH ONE S-2 & S-3 REPORTS. 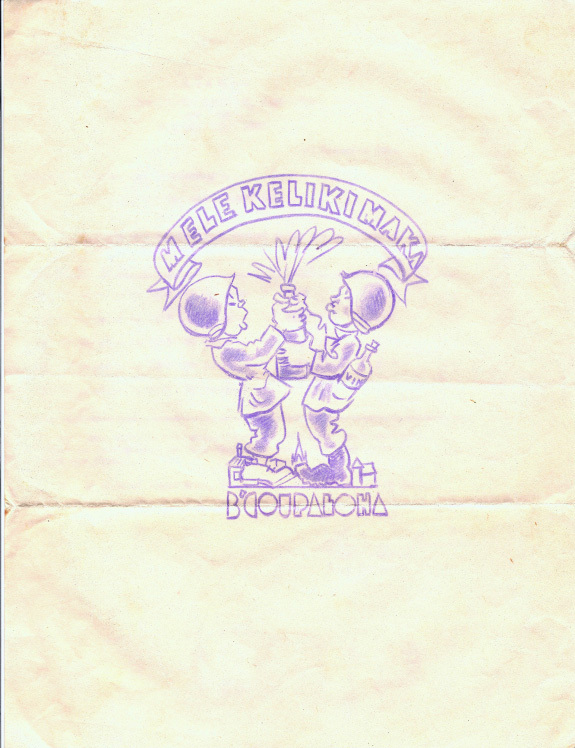 IT WAS SKETCHED BY KEICHI KIMURA. THOUGHT YOU’D LIKE TO SEE IT. TO HIGHER HQTRS KIMURA SKETCHED WITH WATER COLOR & IMPRESSING CARD – TWO “KOTONK” BOYS KNEELING IN PRAYER. I’D SAY IT WERE PRICELESS CARDS. WELL. SAYING GOOD NIGHT – HOPING YOU’RE HAVING A WONDERFUL CHRISTMAS. P.S. DELEGATE FARRINGTON WAS VISITOR HERE SEVERAL DAYS AGO.